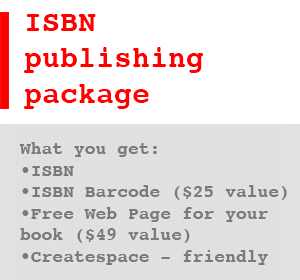 Note: ISBN Publishing package includes a FREE ISBN barcode and much more. Every author who self-publishes their own book is taking a risk with their money. Writing your book is the fun part, but marketing you book is actually a business which requires you to make money on your book sales. The first step to making money is to keep expenses low. After all, a penny saved is a penny earned. For this reason self-publishers should always buy a cheap ISBN in order to move forward quickly with the process of selling your book. After you get started with your discount ISBN you can move forward with marketing your book. For many self-publishers, the goal is 10,000 sales of your book. Traditional publishers put a lot of time and money into marketing books to a mass audience. So this is your proof-of-concept to show publishers that your book could be a big hit. When a self-publisher achieves 10,000 sales it can help to attract a traditional publisher to publish your book. Of course, a traditional publisher will take over selling your book so you can focus exclusively on your writing and you will no longer have to worry about having to buy a cheap ISBN. When a publisher takes over your book marketing, the publisher will supply their own ISBN.